Of the three main materials in a surfboard: blank, resin, and fibreglass, it's the latter that's considered the least environmentally damaging. Hence it gets the least amount of coverage when the conversation turns eco-friendly. Fibreglass, known as fiber glass to our American friends, is infused with resin to laminate a surfboard. Together, resin and fibreglass provide a hard shell that protects the soft foam underneath. The resin and foams used are usually a plastic derivative, while fibreglass is made from silica; molten glass is blown into thin strings that are then woven into matting. Despite the lower priority, various alternatives to fibreglass have been proposed over the years: Jim Banks experimented with hemp cloth decades ago, while Gary McNeil still uses flax seed, and some comnpanies have even woven coconut husks into matting for surfboards. The latest material to create a laminate alternative is wool, and fittingly the idea arose in New Zealand. Paul Barron has some runs on the board as an inventor. Through his company Barron Surfboard he devised and patented Barron Flex, more commonly known as Flex Bar since it was licensed to Channel Islands and widely used on their boards. Nine years ago, Newton's Apple fell when Barron was in his factory glassing a board and got resin on his woolen jumper. "I tried to glass a board with it," Barron told the New Zealand Herald, "but it just didn't work, so I chucked it in the corner of the factory." He kept at it, however, and a few years after the original idea Barron devised Woolight, a wool-based substitute for fibreglass. Woolight works the same as fibreglass, providing internal reinforcement to whatever resin is being used, though its appearance - at least at this early stage - is different. Woolight has an uneven shading, not unlike resin tint colouring. Barron then established two important deals, one at home, one abroad. The first was with New Zealand Merino. They'd supply him with quality wool, and he'd potentially kickstart a stagnant industry. "The global fibreglass market sees about 29 million square metres of fibreglass used every year," explains Hadleigh Smith from New Zealand Merino, "and it's expected to grow by another 30 per cent in the next five years. If we can get even 1 per cent of that global market for sustainable businesses, that's going to make a huge impact for the New Zealand wool industry." And there could be another agreeable side-effect: if farmers sold wool to surfers they may be less hasty bringing out the firearms when surfers crossed their properties. The second collaboration was with Firewire, who've spearheaded the push for eco-boards, even vowing to create a landfill-free board by 2020. By using bio resin to harden Woolight - an organic material - Firewire have created a less toxic laminate. "With Woolight, we are matching or even reducing the weight of our existing surfboards," says Firewire boss Marc Price, "so you've got this strong sustainability story with a performance story that's at least as good if not even better." The first boards Firewire made from Woolight were the Rob Machado-designed Go Fish, which were shown at US SurfExpo last January. At the time it was expected they'd be available in Australia late this year, however it now appears New Zealanders will be the first surfers able to ride woolen boards. Firewire will begin selling Woolight boards there in April or May 2019. At this point, it's unsure which boards in the Firewire range will be available in Woolight. 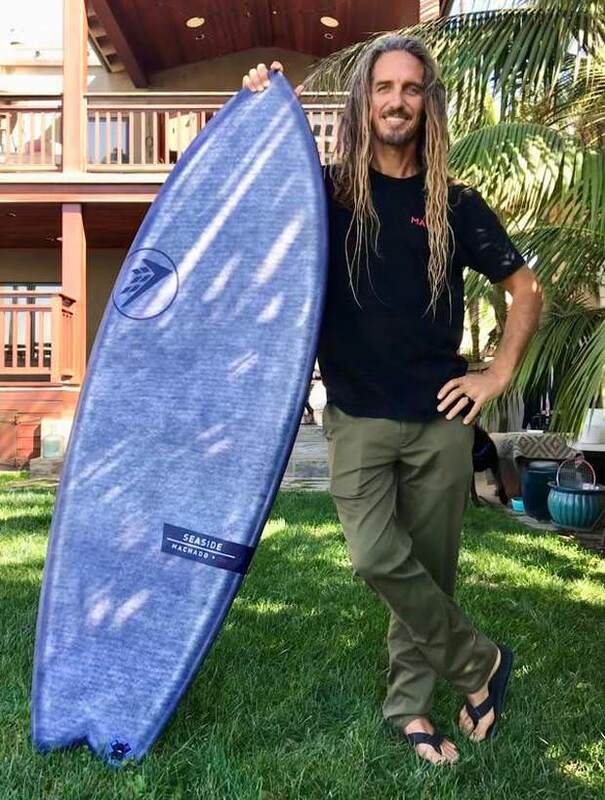 It would make marketing sense to focus on Rob Machado's boards, however Woolight Omnis have been sent to technology publications to review, indicating they may use Woolight across the range. Might be able to shear your surfboard then. Or maybe just keep it for yourself. Good article Stu, Paul is a real innovator in the industry and good that hes getting some recognition. And the R&D guys at Firewire are on to it!! Seriously! I wish the lads well in eco surf pursuits. But this is really opening up a Can of Worms! A blind person can smell the trouble! Before we start let's be clear..NZ =Sheep are human vs Oz = Deported Zombie flesh. note: Peta aren't so keen on 'fine quality' wool Farmers. If this was the Woolight PROMO then why no mention of Vegan friendly in story? RSPCA/PETA are onboard the Mulesed Surfboard Export Trade then? Perhaps Not! All plain sailing! Nothing can go wrong here? Overnite ACA raid on local Surf Shaper-charged with funding animal cruelty racket. Fancy that! Never saw that coming! Surfers can now be labelled Animal killers! My dire observations are bog standard negotiation for wool buyers & sellers. Still get busted if you stuff it inside the board or inside the cover. Go ask Schapelle! Large item of high wool % then these Surfboards possibly need to be declared. Your board may not be on the Carousel...A tap on the shoulder? "Failing to declare your surfboard as an 'Animal Rug' is a criminal offence!" 'Eco' should involve less hassle than flouting a fifty at Bio Security Guards. Anyhow! I thought we all agreed to give up riding the Sheep's back last century. If meat has a huge carbon footprint then it's likely the wool has a large footprint too (and a large fresh water consumption or grey water run off footprint), although is it any less than taking sand to be melted into glass? You can tell I'm bored when I keep writing stuff...It was only a matter of time until Kiwis made their boards from sheep. They find them much more attractive and nice to lay on and also if they cant sleep they count their quiver. Been there done that 1998. Wool,silk, cotton, rayon, polyester and linen can all be used. How do you rate it as a material for lamination Roy?